If athletic directors were better briefed, they wouldn’t say every new coach will play “up-tempo” ball. I know from personal experience that fans on occasion will harass the last few remaining holdouts among Division I coaching staffs who do not as yet use reliable information. I’m willing to grant a special exemption that will allow you to continue such harassment if it occurs with respect to your own beloved team, but as a general question of methodology this type of censure has now more or less crossed the line into “Wear the ribbon!”-variety bullying. At a certain point it becomes a question of simple autonomy. I say let a few paleos track rebound margin in peace, and focus instead on the wide-open vistas provided by those coaches’ bosses. In terms of familiarity with accurate information, athletic departments in 2013 are about where coaching staffs were in 2003. Michael Plunkett, Parker’s manager of technology, sits off to the side at a circular table, laptop at his disposal. With the click of a mouse, he can access any coach you might want to hire, whether it be a head coach or an assistant. And, with a few more clicks, he lays bare that coach’s information — his educational background and coaching background; his win/loss record annually and broken down by season; his salary, including bonuses, buyout clauses, shoe contracts and perks, such as country club memberships and car deals; whom he’s coached with and whom he’s coached for; his academic track record, including APR numbers; videos of him at news conferences or on the court during games; and news stories referencing any black marks he might have encountered during the course of his career, from NCAA issues to personal transgressions. Due diligence is essential, and that is most of what is described here. But when it comes to the candidate’s performance on the basketball court, we are now in the happy position of being able to do a little better than merely ctrl-c’ing the W-L table from the coach’s Wikipedia page. Athletic directors have responsibilities that encompass much more than men’s basketball, of course, and I certainly don’t expect that the busy men and women holding those positions will be conversant in the nuts and bolts of this stuff. Still, as with the coaching staffs they oversee, those athletic directors will soon be able to lay hands on the distilled common sense of this vein of analysis without having to do any of the digging themselves. It’s not that the accurate basketball performance measurement piece is intrinsically more important than any other factor. (Actually if your candidate has a habit of firing basketballs off the heads of his players, you can safely call a halt to your research right there and never touch the points per possession.) It’s simply that this happens to be the piece that’s missing entirely right now. And when annual wins and losses are the alpha and omega of your performance metrics, it can lead you to say ill-advised things. 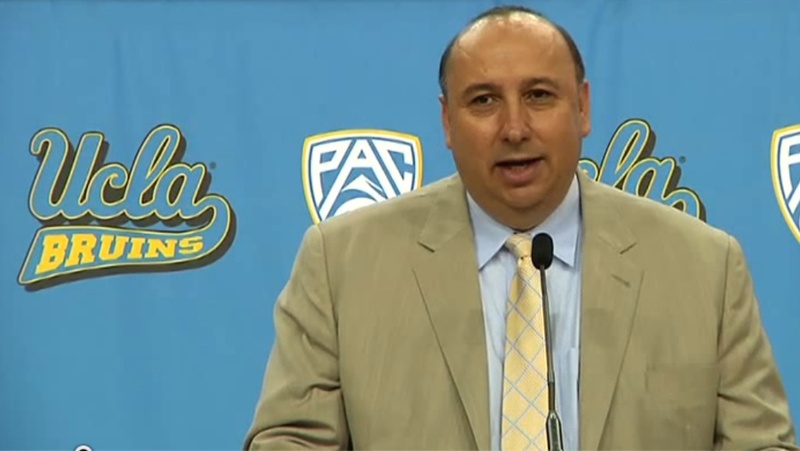 Ask UCLA athletic director Dan Guerrero. That was a teachable vignette, but an acquired comfort with good basketball information can yield benefits beyond mere gaffe avoidance. Performance evaluation is important for basketball coaches too, which is why I wrote at some length about the overlooked but paradigmatic case of Leonard Hamilton’s contract extension at Florida State. In a nutshell: Hamilton deserved his extension. He took over a previously forlorn program in 2002 and has survived for a relative eternity as a non-Duke/UNC coach in the ACC. That alone makes him unique. It is also likely the case, however, that Hamilton’s extension was granted with zero knowledge on the part of the FSU athletic department that statistically speaking — and, yes, partly for reasons having to do with Michael Snaer’s remarkable exploits in hero-ball — the Seminoles have been amazingly lucky in ACC play over the past few seasons. Conversely a vote of confidence in Hamilton from an athletic department with a wonkish reputation for analytics would have been that much stronger (kind of like Jeff Bezos buying the Washington Post). After all, such a department would understand that luck befalls all coaches, including really good ones. And on those rare occasions when you have to hire a head coach, well, it’s a challenge. But maybe performance measures can add a little to the discussion here as well. The driving forces behind college hoops analysis have traditionally been scouting (trying to beat the next opponent), bracket pools and/or gambling more generally (trying to predict an actual outcome), and reporting (trying to ferret out the truth and grab page views), none of which are a precise fit for what an AD really needs when he or she is hiring a new head basketball coach. What the AD needs is a “predict”-the-past-tested projection of a scenario, namely, how the coach would do if they were hired into this new program. When my alma mater hires me as the AD (it’s only a matter of time), that will be what I ask for, either from my high-priced consulting firm or from the eager youngster I hire as my Senior Executive Vice Assistant Admiral of Performance Measures. That day is coming (the accurate information day, not the I’m an athletic director day), and if it arrives with what seems like surprising suddenness it will be due to market incentives and mere demographics. As to the former, look at the NBA. Analytics took hold there with a speed that suggested a level of underlying apprehension if not outright fear. No franchise wanted to be caught bringing a knife to that information gunfight. In the same fashion, the first search firm that tells its client athletic department that it has cool new performance metrics for Coach X will have that field to itself for about a day and a half. And even that dynamic pales in comparison with something far more basic, the fact that kids nowadays dig their tempo-free and those kids grow up amazingly fast. Everywhere they go professionally they bring these handy analytic pieces with them. Soon the metrics that they think have been around forever (I fought in ’05 so you could mock your team’s tempo, man!) will be at home inside of athletic departments too. BONUS millenarian vision! Another key benefit of Reality Sensitivity Training for athletic directors stems from the fact that these are the men and women who are selected for the NCAA’s men’s basketball committee. A little salutary brainwashing of the ADs beforehand could prep them to confront and neutralize the NCAA’s rather curious “all rating systems have flaws so let’s use the worst one” stance. This entry was posted in hoops, HR for athletic directors on November 14, 2013 by johngasaway.